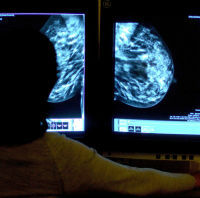 Researchers have made a significant breakthrough in understanding the way in which breast cancer grows and spreads. The British team of scientists used trials with laboratory mice to understand the role played by protein called lysyl oxidase (LOX) and described their findings as a "real game changer". It was already known that LOX played a role in how cancer spreads around the body but the revelation it drives the growth of breast cancer cells was new. People who have suffered breast cancer can arrange specialist medical travel insurance. Taking their findings, the experts developed a prototype that can slow the spread of breast cancer by blocking the LOX protein. This prototype will now be used to develop a medicine that could be tested on patients in clinical trials. Experts from the Institute of Cancer Research and Cancer Research UK worked on the research. A spokesperson from Cancer Research UK hailed the discovery as "exciting". Dr Justine Alford, from Cancer Research UK said: "This research in mice is exciting because it not only reveals new details of how breast cancer grows and spreads, but it could lead to a completely new way to stop these processes in patients if proven in people. "This could help improve outcomes for patients, since cancer that has spread is harder to treat." The study was published in the journal Nature Communications.